The final day of the year and indeed the final progress report of the year too. Today saw some great progress despite it being the holiday season and in fact, we even welcomed a new cadet! The DMU team started and completed the installation of a new electron storage system for M51188. This took most of the day but the results were excellent, rendering this vehicle usable again. The team then spent an hour gathering their thoughts regarding the continuing vacuum leak problem on the bubble car. The service train for tomorrow was prepared. If you are bored (or otherwise) tomorrow or on Sunday, pay us a visit and travel down the line with a glass of Bucks Fizz or orange juice. Some Class 20 maintenance was performed and at the close of play the newly arrived tank wagon was shunted into a suitable position so that the minor repairs needed to make it usable can take place. I made a grave omission from yesterday's report! The VCT's efforts at Duffield were ignored and their contribution to our enterprise should not be overlooked. Duffield cutting between the footbridge and tunnel has been greatly improved including the vital sight lines when approaching the footcrossing on Holloway Road from the south. So a special Happy New Year to the VCT team! Quite a satisfactory day today when it was thought the world would still be sleeping. Richard and Hylton responded to an appeal for a day of shunting in Wirksworth Yard which achieved a number of very useful tasks. The three Dogfish were put into the Wash Green dock for loading with ballast next week, The Duke was moved back to the Maintenance Facility area so work can commence in ernest to return it to operational use, the Saloon was put within the Maintenance Facility ready for work to start on its exterior restoration and the SK visited the new steam shed construction before being berthed before its next outing. Dmus crowding the Third Open restoration were moved out of the way. The work on the "steam shed" speeded up a little and the presentation of the SK demonstrated that the structure could accommodate the largest of our fleet and, thus, any other visitors that might arrive. 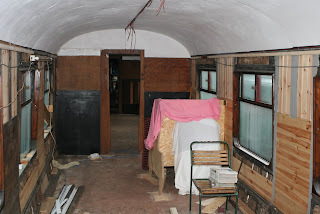 The LMSCA were in evidence with further work on the axle boxes and the movement of the dmus has facilitated this work. The recently arrived LMS Brakevan has received further attention and the owner left at the end of the day to collect more new timber for the vehicle. Late advice was received of the immanent arrival of a second water tank wagon sourced by EVRA from the Llangollen Railway and the vehicle was duly unloaded onto the Car Park siding. This comforts us that we will be able to water visiting steam locomotives in 2011. 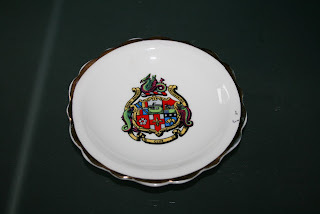 The DMU team had an exploratory trip to Butterley and returned with a few goodies. The day has been dank, foggy and quite miserable and I congratulate everyone who contributed to pushing our project forward. As this will be my last contribution of 2010 I would like to extend my very good wishes for 2011. For our Railway this will represent such a step change in so many ways and cause our many specialist teams several excitements as the opening deadline approaches. The opening of the whole line to passengers will not be the end of the project as there are so many other things to achieve but it will mark the first 10 years of endeavour. If you can actively participate between now and April 2011 we need you! Other behind the scenes work is equally important to ensure our admin, ticketing, marketing and publicity are all in place for the great day. We have got this far by the extreme generosity of people giving of their time, a stupendous 400,000 hours; their money, £600,000 in share subscriptions, other peoples money, some £500,000 and trading profit. 2011 sees a new dawn that will test everyone's health and temper with a programme of pretty constant activity from April through to October. The prize will be an ability to invest in areas of our enterprise that have had to live on a shoestring - maintenance, station buildings, Shottle etc. ect. 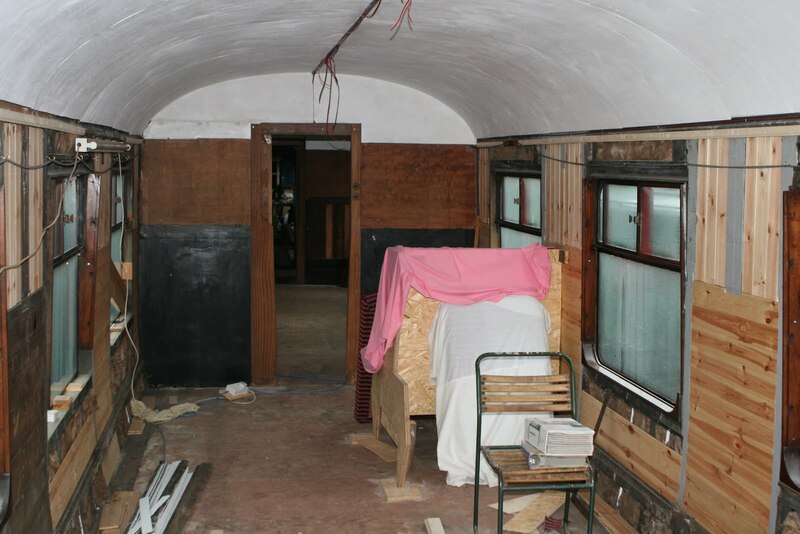 PS - I attach a photo of part of the interior of the Stanier Third Open that illustrates how much this shell has come on but, equally, how much work is needed to make this coach part of our pening train some three months away. The Steam Shed for Ferrybridge No3 inched forward. The EVRA shop had attention to its displays and gathered in more donated stock. The Works Train set sail for all points with a check of the drainage on the "Racing Straight" being the first port of call. The large pipe under the track just north of Shottle received attention to aid the flow of water and then the straight south of Hazelwood was attended to, again, improve the drainage. Logs were picked up from the area around MP134 and taken to Idridgehay for our neighbour in the former Station building. Wagons were shunted to order at Duffield and the project to cleanse the lineside of redundant sleepers was declared largely complete. A most useful day. Life is steadily returning to normal although Wirksworth was bathed in a damp cold fog today that chilled all but the stoutest hearts. Nonetheless, quite a number of people met the challenge and the DST continued their refurbishment of Henry Ellison with further work on the axle boxes, connecting rods and back cab sheeting. The LMSCA reported further fitting of pareses and lighting in the Third Open together with more axle box cleaning. The recently arrived LMS Brakevan also received attention so that it may join the running fleet in the foreseeable future - just a little pressure! Further south the VCT returned to the attack adjacent to Holloway Road in Duffield as conditions gradually enable them to renew their efforts with the vital work. Tomorrow sees the PWT with an opportunity to return to work with much to do before next April. A gentle day with a birthday charter for Matt Higham and his friends. Matt has been very active as one of our younger volunteers and has the honour of having Bob Gibbens as his Granddad so has steam in his blood! It was very good to also welcome his uncle, Spencer Gibbens, who unlocked the Railtrack bureaucracy that gave us initial access to the Railway and orchestrated the lease/purchase agreement that has enabled us to do what we have done in the last ten years. Many thanks to the train crew that made it all happen today. The Works Train is cancelled tomorrow as many of the team are unavailable but the VCT and DST hope to be in action. Works Train activity will now be consolidated to Wednesday this week. The main achievement today was the installation of the Duffield south buffer stop after the new extension was slewed and ballasted. We are now 30ft nearer Derby. The Steam Loco shed made progress so that No3 can live under cover and I am assured that it has been constructed to cope with any other vehicle that is within gauge. There was some snow clearance during the morning to give the necessary walkways on the Wirksworth platforms. Planned activity tomorrow surrounds the Stanier Third Open and I am grateful to the LMSCA team for this extra effort. My annual appeal is for those of you who live close to any area of our Railway is to bob in over the holiday period to ensure no unwelcome guests are present. There has been a spate of thefts in the Wirksworth area that would indicate that thieves are taking advantage of the weather conditions to wreak havoc. Another extremely challenging day with yet more snow but the Works Train ventured to Duffield and the team assembled the sleepers and rails for the southern extension of some 30 feet towards Derby. A great achievement given the miserable conditions. At base useful progress has been made with the Saloon's on board gas system allowing the stove and water boiler to work. We hope the work will be now signed off by a friendly qualified person that will allow us to use these facilities in 2011. For those of you paying attention, spell-check confused refurbish with republish on yesterday's report. I am happy to confirm the first vacuum cylinder from the Third Open has been furbed! Special credit to Neil who has cracked, after a great deal of effort, the ability to book a through ticket to Wirksworth from the national network commencing in April next year. Another "coming of age" moment. Tomorrow sees those that wish to participate assembling at Duffield to reposition the buffer stop on the newly extended headshunt. This is a bit of an omnibus edition as I would firstly like to say a tremendous thank you to all involved in our Santa operations. We ran all the services we promised against a background of sub zero temperatures and the most inhospitable conditions for the machines and people involved. A great number of folk pitched in to make it all work but we should pay special homage to the Victorians; Rod, Mary,Yvonne and John together with Anton who kept the catering in order and Leigh who ensured that we had a train that worked. We should also say a special thanks to Santa and his deputy, the deputy was somewhat poorly causing Santa to increase his productivity at short notice. A number of our cadets were in evidence and it is a fact that without them we would not have delivered and I thank them for their vital contribution. As an aside, I am quite reluctant to pursue a Santa programme next year that is so dependant on a very few of our team taking part. In many ways it's your choice whether we carry on with this opportunity. Today saw a return to some semblance of normality with everything made so much more difficult by the awful temperatures. After dramas associated with frozen points the Works Train reached Duffield and moved a great deal of brash to the burning site. The VCT were back to full production at Duffield creating the brash to be moved which included a Sturgeon load on the last rain.The Komatsu followed the Works Train and discharged the Sturgeon of the contents of the southern extension of the head shunt together with ten bags of ballast that will be useful when they thaw out. The LMSCA had a good turnout with beading applied to the seats and ceiling of the Third Open and a splendid start was made to republishing the vacuum brake cylinders. There has been much material taken away for homeworking as the deadline approaches. The DST made great progress with Henry Ellison with the first axle box refitted, the rear cab steelwork largely completed and the horn guides have been cleaned up. The Duffield platform project benefited from supplies delivered on the Sturgeon and we should be able to make limited progress over the next few days. The Booking Hall had a round up of revenue and stock from the Santa Train season. There is lots to do and it is planned that we have a Works Train tomorrow and next Tuesday and Wednesday and the same again next week. Pole so he can get himself ready for his upcoming round-the-world tour. longer standing in front of the buffet car heater. necessarily highly complicated and time-consuming manner. volunteers, shareholders, members and readers a very Merry Christmas. Day 3 of 4 for our Santa trains. The day started off with a small snow shower giving a light dusting of snow, before warming up to -4 degrees. Not deterred by this, our team of volunteers put on the show and many smiles were seen. Many thanks to all! Iris ran a charter to Idridgehay with the guests enjoying afternoon tea inside the observation saloon parked in platform 1. Down the yard, further work was done to try and fix the mysterious vacuum leak on 55006. We had a number of brave souls who endured the arctic weather to prepare for the second and last Santa weekend. Dmus were prepared, fuelled and cleaned, the Gatex stock readied and the Saloon rearranged for a party tomorrow. Stores were collected and loaded, the platforms gritted and repairs to the First Open's electrics achieved. Graham bottomed the reversing fault on L J Breeze and I add an omission form yesterday's report regarding the VCT who, with a very small team, burnt a great deal of the accumulated brash from their Duffield operations. We were pleased to provide facilities to the Rail Accident Investigation Branch for their training day. Jeff rose to the challenge and provided them all with some welcome hot soup at lunchtime. We remain short of helpers for service on the Gatex Saturday and Sunday so if you can lend a hand please come on down. PS - an attempt to make progress next week will see the PWT working with the VCT at Duffield on Tuesday together with unloading of materials for the extension of the Duffield headshunt. Wednesday will again see activity at Duffield associated with the platform supported by the Works Train. There will be no Works Train on Thursday but the Komatsu will be supporting further work on the platform. A general plea for attendance as we have a lot of catching up to do! A thin day as the weather conspired to frustrate permanent way activity and the team retired hurt around midday. A little joy was a charter to Ravenstor for the Wirksworth Church of England Infant School where some 80 were conveyed in the Bubble Car and Santa was on hand to greet them on their return. Many thanks to Chris Beale, John Tedstone and Anton for turning out for this short, but successful, tour of duty. A tyre repair man was sourced to deal with a flat on the Komatsu which luckily only needed a new inner tube rather than a new tyre. Work goes on to tee up the Tamper provision for March next year. We await what the weather will throw at us over the new few critical days. Firstly, an omission from yesterday's report when we provided test facilities for a Severn Tunnel road/rail rescue vehicle operated as a joint project between Network Rail and the Avon Fire Brigade. Ably hosted by Mike Thomas the combined test team of 13 declared that they had a most successful day. Today the PWT set sail for Shottle and removed the raised check rail there as the requirement for this installation has been replaced by the bridge check rail located on the Gorsey Bank line. Attempts to free the southernmost breather switch on the long welded section proved frustrating and warming gear will need to be employed to resolve this problem. The LMSCA have increased their productivity and worked on the beading within the Third Open and commenced examination and cleaning of the axle boxes. The Komatsu received attention to a failed bracket that supports an oil filter and then went on to excavate the area in the car park previously covered by a lose metal plate. With assistance the plate was placed at a lower level and the whole area filled with ballast removing a long standing hazard. Peal Oil responded to some pleading on Monday and delivered fuel for the weekend and we also received supplies of the 2011 timetable brochure. The Multicar was taken down the line to discharge the remains of the weed killer in the tank before frost damages the pump and nozzles. On a most pleasant note I received a most satisfactory and unexpected donation from the Chesterfield branch of the Amicus Union towards our endeavours..
After the recent snow it was very satisfying to get back to a near normal Tuesday with a very large team on site. The LMSCA, conscious of deadlines approaching, had their heads down as they ready the Third Open for its starring role next April - no pressure then! The VCT had a splendid turnout of nine encouraged by the prospect of their Christmas lunch at the Puss in Boots claiming to have achieved more in the work morning than usually managed in a full day. The PWT had a mixed day as they propelled what may have been our weightiest train south with the Sturgeon, 2 Grampus, a Rudd, Flatrol and two Lowmacs added at Shottle together with the Tool Van and Brakevan. The Sturgeon and wagons loaded with bagged stone were deposited at Duffield and three loads of brash transported from Duffield to the burning site. At the close of play the team managed a record three wagon loads of logs of which two were delivered to Shottle and one to Wirksworth. The DST dealt with preparation of the axle journals and eccentrics of Henry Ellison, started to overhaul the axle boxes, continued work on the foundation ring, coupling rods and connecting rods. Our lone honorary plumber dealt with four leaks in the Buffet Car and restored a water supply to the Training Room and the plumber's mate returned washed and ironed table cloths to the Gatex and left with a monster order for supplies for the next and final Santa weekend. I am most grateful to both of them for all the effort put into keeping us operational. The Duke has be put onto display in Platform 1 and the Santa business has received much attention throughout the day. Many thanks to all concerned for making such a successful day after the frustrations of being buried in snow - there is a lot of catching up to do! Much warmer today with around a foot of snow melting overnight causing the catering team to go to arms with mops in the buffet car first thing. Today was day one of our annual Santa specials. This years Victorian theme was well received and thanks goes to everybody who has put in some very hard work today. There were many happy guests who visited Santa in his Victorian Toy Shop grotto at Ravenstor before sampling mulled wine and mince pies in the Gatwick Express coaches. Elsewhere, the LMSCA were in full swing and a team painted the tank on the recently arrived Austerity locomotive. A tremendous turnout today to prepare for the Santa trains. Vehicles were moved round to be in their correct positions and the Komatsu was in action clearing areas to be occupied by visitors cars. Snow clearing and checks were made of the Wash Green crossover and bridge check rail section on the Gorsey Bank line for next week's test customer. Further Santa supplies were collected from Morrison's and Rod & Mary completed their final touches to Santa's mobile grotto. The platforms at Wirksworth and Ravenstor were finally cleared of snow and all the accumulated crockery from the Buffet Car was moved to the Mess Hall, which now has running water again, for washing up - and there was a lot! The Buffet Car was then cleaned and the train decorated until dusk descended. The boffins ensured that lights would be available in the First Open and heaters have been strategically placed to provide a warm and welcoming environment. After lunch the tree arrived and turned out to be a monster. I had asked for one about 15ft high but we received the jumbo sized version of around 25ft - maybe the largest tree on any heritage railway? 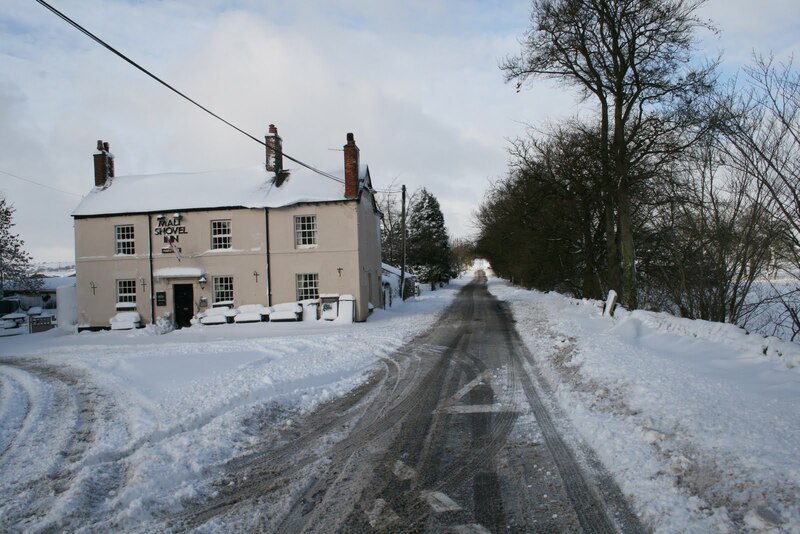 There was also a catch up of phone messages and postal bookings for the Santa season after the post has been somewhat interrupted by the weather. Grateful thanks go to all who heeded the call for assistance as without them we would not at all ready to receive our visitors. I am most grateful to the small but active team that turned in today who checked the line to Duffield which involved digging out the flangeways of the level crossings at Gorsey Bank and Idridgehay. This task aided by John Silvester who freed the pointwork at Duffield North, enabled the confirmation to next Tuesday's customer that all would be well for the test of a Network Rail Emergency Response vehicle. The team also did a track examination of the Wirksworth Ravenstor line in advance of the weekend's operations. Much progress was also made with the conversion of the former Tarry Office into one that will be the centre of all our record keeping associated with the Safety Management System requirements, all quite dry but so essential to operating in the current climate. Tomorrow sees a final purge to get ready for Santa including the preparation of the Buffet Car and Gatex vehicles which have been quite frozen up over the last two weeks making the basic task of washing up nigh on impossible. Another post for the records I'm afraid! 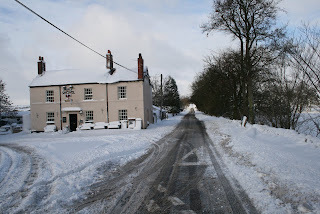 However, there were perceptible signs of a thaw during the day and the station approach road is becoming quite passable. Stores were gathered from Sainsbury's for the upcoming Santa season and a further check was made on the frozen plumbing. We will try and examine the line to Duffield tomorrow and have a lot of preparation to do on Friday to be ready for the Santa weekend. The view from the Wirksworth Station igloo remained fairly grim but a number of hardy souls tried to keep the show on the road and I am most grateful for their efforts. Further work was undertaken to free points and ensure there was a manageable route for the Santa train equipment to access Ravenstor. Partially successful but the three Dogfish in Wash Green dock stubbornly refused to move and it was decided to await Friday when the temperatures are said to rise before there is another attempt to move them. A small DST continued with repairs to the back cab on Henry Ellison, overhaul of the brake gear and refurbishment of the connecting rod. Rod and Mary made their way in from even deeper snow to decorate Santa's grotto and the Booking Hall processed Santa bookings which had arrived after around a week of no mail at all. A lone volunteer spent the day unfreezing the staff toilet, Mess Hall and tending to a flood in the Catering/Training Block. All very unglamorous but quite critical to the wellbeing and comfort of today's team. Our new Book Keeper, Angela, had the first of her regular Tuesdays with us and has started to master the task of ensuring our accounts are meaningful and up to date. Based on present information there will be no activity on site tomorrow, an examination of the line to Duffield on Thursday and a full preparation for our first Santa train on Friday. The thrust of today from a small team of six was to continue clearing the station area and make a start on clearing the yard of snow. Enough of the yard was dug to enable the vehicles that will take the visitors to Santa's Grotto next week to be coupled together. It is likely that this clearance work will continue tomorrow, so as per an early e-mail, if you are able to lend a helping hand, do pop along! Valiant efforts have been made today to make safe walkways on the platforms at Wirksworth and Duffield with some success. The work at Wirksworth will make a contribution to next weekends Santa trains if the white stuff lingers through the week. Obviously the pointwork around Wirksworth Yard is under snow and it would be useful if any of you can reach the station tomorrow to begin the process of clearing, again with next week's activities in mind. 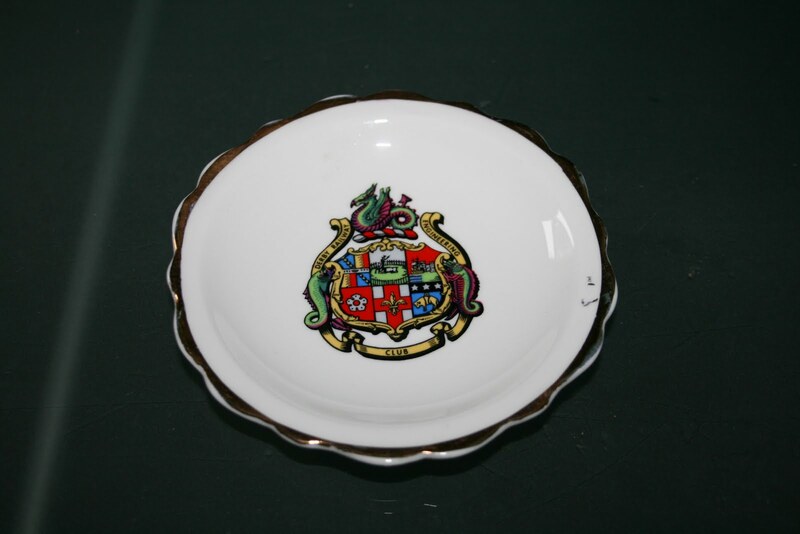 We are having some work done in our kitchen as a result of water damage and the builder produced an example of some china ware he had come across. I attach a photo which may prompt one of you to comment on its origins. We have had to suspend train services this Saturday due to bad weather conditions. There is lots of snow and ice surrounding Wirksworth station. However, at the moment, we still intend to have the station open so that passing visitors can drop in and have a coffee. Just for the record when these posts are researched deep in the future. A visit to the Station today revealed an impassable station apppoach to all but 4x4s and all the platforms buried under 2 to 3 feet of snow. Even the Mess Hall padlock had frozen up and there are some spectacular icicles hanging from the Buffet Car. Reluctantly I have advise our Day with a Driver clients for Saturdays that no trains will run together with the train crews involved. Any of you visiting the Railway in the near future need to be very careful as all the hazards are neatly hidden. I was going to say "none"! Reaching the Station proved impossible in the conditions that have prevailed but the has been an immense amout of homeworking as we stride towards the opening of the whole line next year. For those of you more from more distant parts I am going to attach a warming picture of the Malt Shovel, taken today, so you know what it looks like! Sheffield, was happily satisfied with his experience. considerable rejoicing, as well as dancing round the bicycle. stop it scraping along the ground and giving us a hernia trying to open it. its repairs. Said BSK was tidied up, swept and mopped, much to its surprise. windows removed, so people don't waste their time looking out of them. The final weekend of timetabled passenger services began today with reasonable loadings. The Day with a Driver and three Drive a Diesel guests all thoroughly enjoyed themselves. In the yard, the LMSCA furthered the TO coach and the DMU team continued working on the class 108, with further refurbishment of door backs; a continuation of yesterday. A door back consists of the wooden surround pieces and a Formica panel in the middle and at the top. Refurbishment involves removing the wooden surrounds and sanding the old orange paint off so that they are nice clean wood again. Then, the components are stained with a Walnut wood stain using a sponge! Whilst that is drying, the relevant parts are covered in new Formica, which involves removing the old orange and damaged Formica, cleaning up the board behind, measuring and cutting a new piece of Formica and then gluing it to the board. This piece is then put back on the door along with all the rest of the parts and they are given a coat of clear varnish for a shine. This takes about 3 hours per door and there are 6 to do on the vehicle. It is a long process so next time you open any door in a railway vehicle on our line, consider what it takes just to make it look nice!!! Phil's last day with us was very productive with a third session of radar detection testing involving the 2 Car Met-Cam set. The customer was content with the results after being ably hosted by Phil, Graham and Peter. There are indications we may see them again! The LMSCA retrieved the machine tool delivered yesterday and stored it safely in their "workshop". Hylton test drove the Fitness To Run forms produced by the Class 20 Association together with David N and had a few observations to feed back that I am sure will be helpful in keeping this valuable machine road worthy. DMU maintenance involved the addition of anti freeze to the Class 108 whilst, inside the vehicle, good progress was made with doors and the application of Formica panels. We say our final farewells to Phil at tonight's Board Meeting although I suspect he will be back with us from time to time, if only to escape the mother-in-law! After yesterday's excitements a more sober day ensued with the VCT renewing their renewal, or reconfiguration, of the fencing north of Derby Road bridge 4 that divides us from a little part of the Chatsworth Estate. A most inventive approach has been devised that produces a very adequate fence that is not quite as tall as it was and reuses the resultant materials in a most productive way. One very large fire was the end product of the less than useful material. The Permanent Way Team depleted by too much enjoyment made significant inroads to the old sections of Duffield Tunnel track, all of which is only fit for scrap, located at Shottle enabling us to realise some value towards the cause. They managed to deal with around 50% of the material and will return to the attack next week. A helpful by-product was the release of some 16 reusable sleepers that will be applied to the extension of the Shottle loop. A lone Silvester pointed a further 40ft of the Duffield platform wall, quite a magnificent effort that enhances this wonderful project. We took our farewells of Bob Dixon, known as "Ashford Bob", who has endured the rather elderly caravan on the Wash Green dock during his regular visits. The costs of travel from Kent have defeated him and he is joining forces with the Folkestone Harbour Railway project.His experiences on the Ravenstor Incline should help and we wish him well for the future and he has promised to follow our progress from afar. Enid reports that John Gratton is on the mend and may be home from hospital this weekend if all is well. PS For those that have seen a little part of my cine film from 1965 I regret I was no Ivo Peters and the cost of standard 8 film plus the clockwork mechanism encouraged very short busts of activity and my income was around £6 a week! I know this was a fortune in them days! The first few seconds were from bunking Nine Elms - if only digital photography had been available then. I was great to meet the fireman on the 4F tour during the Steam Gala with Bellerophon and No3 - we are all very young at heart and will long remain that way. A day that exceeded all expectations and, in many ways, represented the culmination of the first phase of our project. The 10th Anniversary celebration was brought forward from its due date of the 8th November to combine with the accolades following Phil's decision to depart from the enterprise after 10 years involvement deeming his part of the adventure complete. The day commenced at 1100hrs with Ferrybridge No3 leading a two coach formation on a through trip to Duffield with some 80 working volunteers who had made it all happen. A gentle and splendidly evocative journey took some 55 minutes before arriving alongside the newly reconstructed platform. There were many photo opportunities at Duffield as the locomotive took water and coal before running round the train. Many, firsts were accomplished including the first passenger steam train since 1965 (the 4F excursion) and the first steam locomotive run round in living memory etc. etc. Many local residents were in attendance to witness these momentous events. The journey back to Wirksworth was more leisurely being all up hill with pleasant stops at Shottle where the owners of Peak Oil were surprised to observe our significant outing and at Idridgehay where no one was perturbed by our pause there. On arrival at Wirksworth, some 30 minutes in advance of the planned schedule, the appropriate speeches were made before anyone could attack the sumptuous buffet. Opportunity was taken to indulge in some justified mutual back slapping on this most significant day. Peter Taylor thanked all concerned on behalf of the share holders and Mike Craft presented Phil on behalf of EVRA a delightfully restored Midland Railway chair together with life membership of the Association and the results of a collection resulting in a large number of garden centre gift vouchers. Phil responded with a potted history of his time with preserved railways but, strangely didn't mention time before the mast. Ann accompanied Phil and her contribution in the early days of the enterprise was gratefully acknowledged and perhaps didn't want to know about his lonely times on lighthouses. Jeff excelled with the buffet arrangements and Dorothy organised the puddings together with two magnificent cakes, one to celebrate our 10 years and one to recognise Phil's "retirement". I can only say that today represented our fledgling organisation at its best and the good will from all who participated created a very warm atmosphere. I am sure those who said some years ago "it would never happen" were revising their script to say "haven't they done well". I found the whole event pulled on the heart strings as we steamed up and down the valley - absolutely marvellous! 10 miles in 10 years, 5 new platforms, no bank borrowings, 8 to 160 workings volunteers - sheer genius.